I did it, I finally gave in. I bought a refillable rollerball pen. I bought one of Nathan Tardif's (Noodler's Ink) rollerball pens. Several things precipitated this decision. I have always thought it was a neat idea. 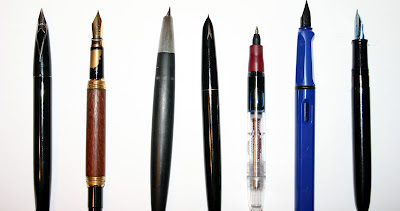 I prefer fountain pens over rollerballs, ballpoints, felt tips, etc... but it is not always feasible to stick to higher ground; I am a teacher... 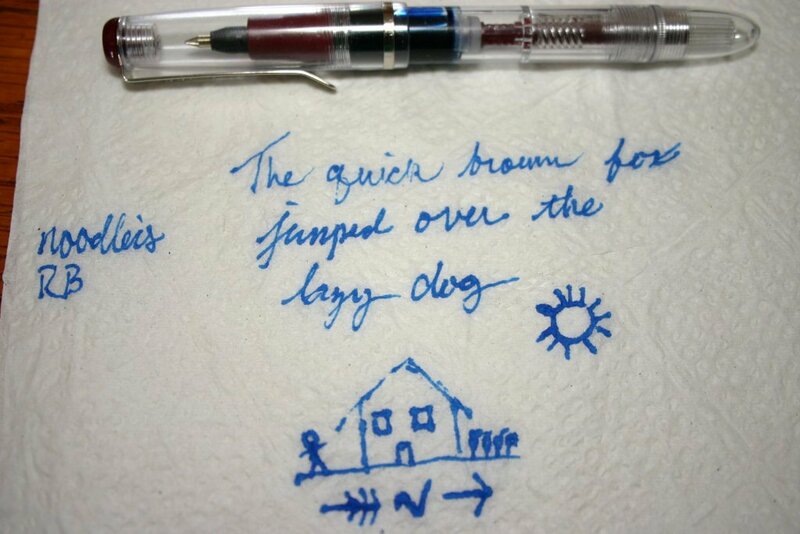 I can't always use a fountain pen. I have looked at the refillable rollerballs for a while, but the cost point always got me. Finally... the pen was from Noodler's Ink. I am not saying they are perfect or every product is flawless, but I really believe in what Nathan is doing. 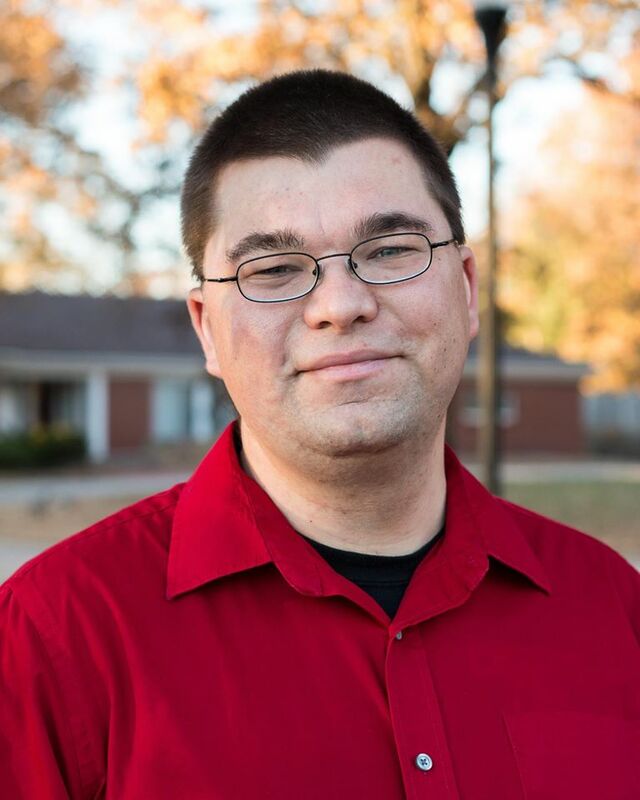 He provides a quality product, at a great price. 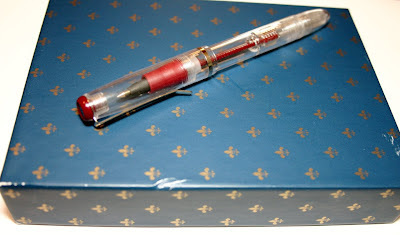 I bought my pen from Isellpens.com. I bought it on sale for $12.88. 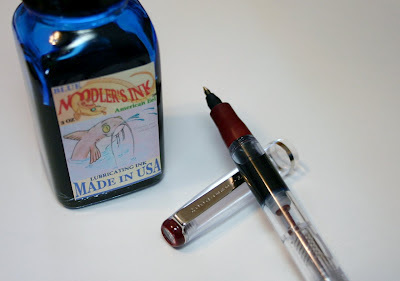 You can see all the specs, etc at the Noodler's Webpage. The one on sale was red, I like it. It is a simple little gem. It is not flashy, but if you read any of my other posts... I am not so much into flashy. It works. It is not heavy by any means, but it is not so light that it feels flimsy. To fill it, the cap, and a cap over the filling piston has to come off. You can see a little bit of the branding on the cap in this picture. 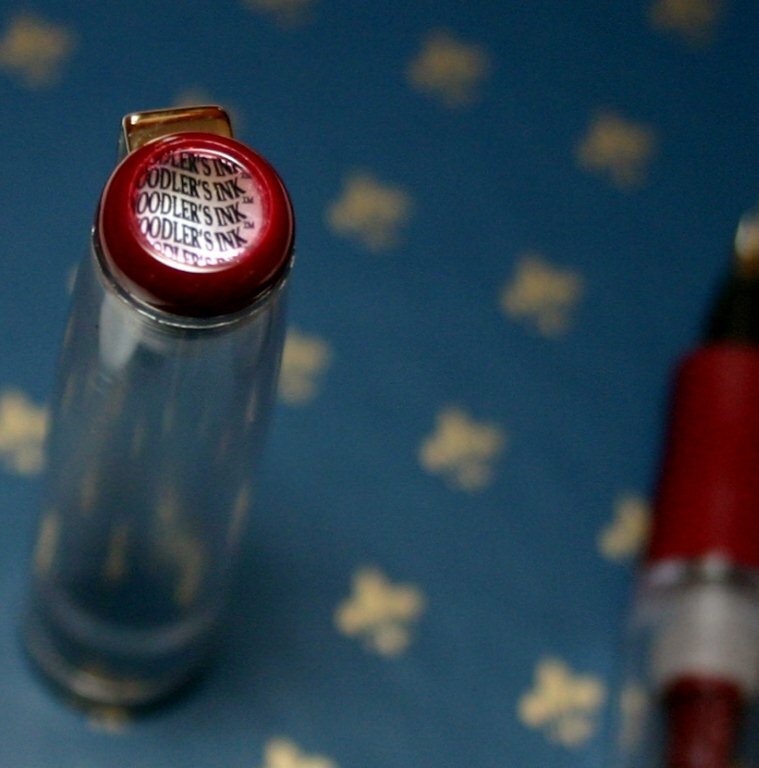 Noodler's Ink is printed on the top of the cap and on the front of the clip. Aside from that, it has a very clean look. The first fill of most my new pens is an American Eel Ink. They are supposed to be really good for piston fill pens, as it lubricates everything. Who am I to argue... it rings true with my baloney meter. I did not fill it all the way, in fact I think I filled it about half. I figure, if I don't like it, and I am not going to put it into the rotation, it is just more in to either be forced to use, or dump. It fills very easily, there is not that pressure you sometimes feel with piston fills- there are some that you fill you are going to break it just to get it to move. The pen writes fine on Rhodia paper, and Clairefontaine Triomphe stationary, as you would expect. 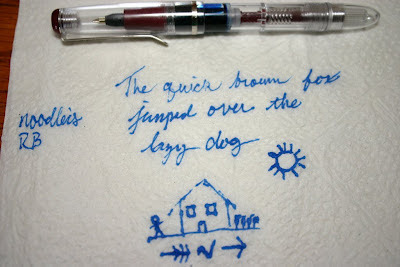 I was impressed at how well it wrote on none-fountain pen-friendly papers. Yes, yes, I know it is a rollerball, but the ability to use all the vibrant colors of inks on various other papers, is really a great perk to me. First I tried it on a papyrus filled notebook. I don't use this notebook very often, because the only pen it likes, is a Fisher Space Pen... it doesn't even like Pilot G2 pens. I am not saying it was perfect, but I was impressed. My second test was on a coffee shop napkin. I don't write a lot on coffee shop napkins, but is nice to know I can, particularly with an ink that is prone to be a little feathery. You can click on any of the pictures and they will enlarge. There is, of course, a little bleeding, but it works as well as anything else. If you look below, you can see an enlargement of the napkin. My overall impression of the pen is good. I wish it was a little bit longer. I don't like to post my pen caps when I am writing, but I may end up doing so with this one. It is just a little shorter and the grip is just a titch skinnier than my usual suspects. 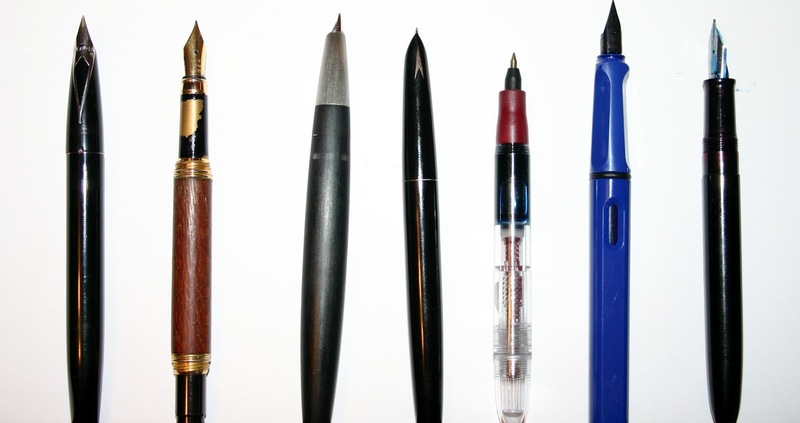 For less than $20 it seems to be a good writing instrument. I will definitely put it through the paces, and see where it ends up.